Minimum 20pax for self-collection order. All self-collection must be made at 187 Macpherson Road S(348545). 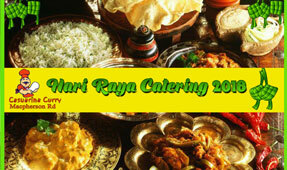 Minimum order is 30 pax for disposable and full buffet delivery. Orders must be placed minimum 5 days in advance. All Price inclusive of 7% GST. To ensure that you have placed your order successfully you should receive a copy of your order to your email. The catering manager will contact you within 1 day to confirm the details provided to us and also the availability for your time slot. 50% deposit is required to confirm the order. Any changes to your order must be made 1 week before the order date. Cancellation before the event will result in your deposit being forfeited. Cancellation on the day of the event will require you to pay the full amount. Packing material will not be provided as it is against the NEA law.